Francis was an instructor working at a dive centre in French Polynesia. One day, he picked up a couple from a nearby hotel to go diving. They had asked to do a drift dive through a pass in the reef, a site notorious for fast currents and scores of reef sharks. As always, on the way to the dive centre, Francis asked them about their diving experience and formed the impression that, although they both had a few dozen dives logged, the wife sounded confident and relaxed but the husband did not sound so sure of himself. Francis made a mental note to stay close to the husband and watch him carefully, especially during the drift dive. When divers understand the benefits of a checkout dive, then everything works perfectly. They do the dive, have a nice time and get back into the “swim of things”. On the boat, Francis noticed during the gearing-up process that both divers wore what looked like too much weight in relation to their shape and size. Instead of saying something, he gave them the benefit of the doubt. Sure enough, once they were in the water, drifting along at depth, he saw them inflate their BCDs to compensate for the excess weight, giving them a head-up-feet-down profile in the water. He made a mental note to mention this during their surface interval, and advise them to wear less weight on the second dive. Staying close to the husband as planned, Francis was perfectly placed to react when the husband’s weight belt, already low on his hips, came loose, slid down his legs, caught briefly on his fins and then plummeted into the depths. As the husband headed quickly for the surface, his inflated BCD expanding as he went up, Francis grabbed hold of his leg and went up with him, trying desperately to slow him down and exhaling frantically. When they reached the surface, Francis was okay but the husband was out cold. He signalled the boat, and helped the boat crew pull the unconscious diver in. Then he looked around and saw, to his relief, that the wife had now surfaced too. Once she was safely in the boat, he called out on the radio for an ambulance to meet them at the dock and administered whatever first aid he could. The diver was breathing and they had oxygen on board. 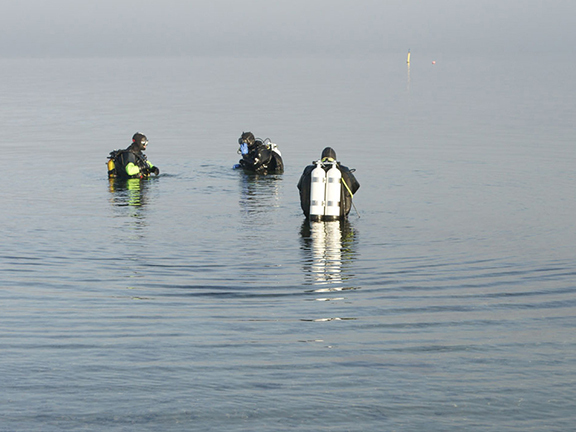 The injured diver was hospitalised, then evacuated off the island. He eventually made a full recovery. His wife departed with him, but before flying out, she was effusive in her praise for what Francis had done and told everyone who would listen that he was a hero. Francis did not feel like a hero. Ever since the incident, he had been privately kicking himself. He knew how close he had come to having a diver under his care lose his life and that he had risked incurring career-threatening, if not life-threatening, injuries himself. He was all too conscious of the fact that it had been his decision to take the divers out to the pass despite spotting that at least one of them might not be ready for such a difficult dive. He had also failed to intervene when he saw them wearing what looked like too much weight. Now, the police had interviewed both him and the dive centre, their training agency had asked for an incident report, the story was in the newspapers and rival dive operators were making sure that plenty of harmful gossip kept circulating. No, he did not feel very heroic at all. The diver had suffered no permanent harm and now had a new story to tell at dinner parties. However, the negative impact of the incident for both Francis and his dive centre was much longer lasting. Their reputations—locally, internationally and with their training agency—had been damaged. The story would surface prominently in online searches for diving in French Polynesia, and this would have an adverse effect, not only on their own business but also on scuba tourism in the region as a whole. Divers have the whole world to choose from when they plan their vacations. It does not take much bad publicity to make them look elsewhere. How can Francis and his employers protect themselves and to make sure that nothing similar ever happens again? The dilemma that Francis was faced with that morning is one that is all too common. Every day, dive operators all over the world take people out diving; most of them are strangers they have never met before. To judge a diver's competency when they turn up for their dive trip, all the dive operators have to go on are the diver’s word, a certification card, a logbook (if they are lucky) and their intuition. These all help a little, but they are no substitute for actually seeing someone in the water. It is normal for sport divers to have long gaps between dives, and during this downtime, their skills get rusty and their instincts fade. Many are aware of this and are happy to do a checkout dive on their first day back in the water, at an easy site where they can get used to everything again. Some dive operators ask divers to perform a few skills during the checkout dive to demonstrate their competence. If this reveals important areas where a diver needs further practice, then they will assign an instructor or divemaster to work with them in a pool or off the beach before they go out diving again. When divers understand the benefits of a checkout dive, then everything works perfectly. They do the dive, have a nice time and get back into the “swim of things”. Meanwhile, the professionals have a chance to see how competent the divers are, correct minor issues and make sure that the dives they do during the remainder of their stay match their abilities. It does not guarantee that a dive accident will never happen, but it reduces the chances considerably. The insistence that divers demonstrate skills during the dive can even generate full-blown conflict, particularly among those who are concealing skill deficiencies and do not want to get found out. This applies especially to divers who cannot clear their masks without panicking. They will choose operators that do not require checkout dives too, in order to avoid discovery. Dive operators cannot leave it up to divers who need a checkout dive to volunteer for one. Nor can they believe anyone who tells them they are expert and do not need a checkout dive. This is not necessarily because divers are wilfully dishonest. It may just be that they do not have the experience to be able to judge their competence objectively. However, because they know they can lose business by asking customers to do checkout dives, many operators, like Francis’ employers, choose not to require them. They know the possible consequences, but they still take the risk. Scuba diving is a tough business in which to survive, and nobody ever wants to see customers walk out the door and spend money with the competition. It is true that there are some divers who stay super-dive-fit or who are so experienced that their scuba diving skills have become as automatic and instinctive as walking. Experience suggests, however, that there are not many who genuinely qualify to be included in this category. And most of those that do would have absolutely no objection to doing a checkout dive. The idea that it was somehow demeaning would never even cross their minds. They would just enjoy the dive. Do not consider the checkout dive requirement as a factor when you are choosing a dive operator. Whenever you go diving with an operation you have not dived with before, pay them the courtesy of doing a checkout dive or even volunteering to do one. Whenever you have been out of the water for a couple of months, do a checkout dive as the first dive of your next trip. Simon Pridmore has been part of the scuba diving scene in Asia, Europe and the United States (well, Guam) for the past 20 years or so. He is the bestselling author of Scuba Confidential: An Insider’s Guide to Becoming a Better Diver and Scuba Professional: Insights into Scuba Diver Training and Operations and has just come out with a third book, Scuba Fundamental: Start Diving the Right Way. All are available from Amazon in a variety of formats.